I really like how this one turned out. 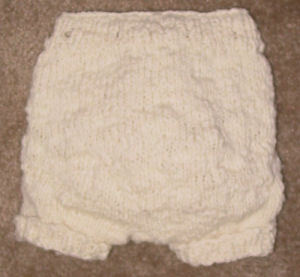 I made it from the WoollyBabies shorts/longies pattern that is no longer hosted online. It might just be that the site is temporarily down. I was thinking I might have to frog some of it because I went totally overboard on the short rows (or so I thought). But it actually seems to be just roomy enough and it looks really cute on E. One thing I would do differently next time would be to cast on looser or on larger needles. This was my first attempt at a gansey gusset and I think it turned out nicely. I will probably be adding more of these to soakers I make in the future. I still need to make a cord for the drawstring, but E isn't mobile yet so I have a little time. The wool is from the rescued sweater I snagged awhile back. I haven't even lanolized it yet and it's working great so I know with a proper lanolizing, it should be awesome! 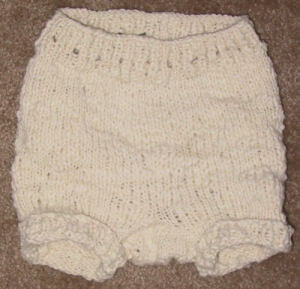 My next project is to start on some Aubrey Doodlepants out of some acrylic yarn that I have (don't have enough wool, boo hoo). I kinda missed out on the WSG knit-along, and would still like to do it. If I run into any glitches, I can always check the messages from the KAL and get help :).